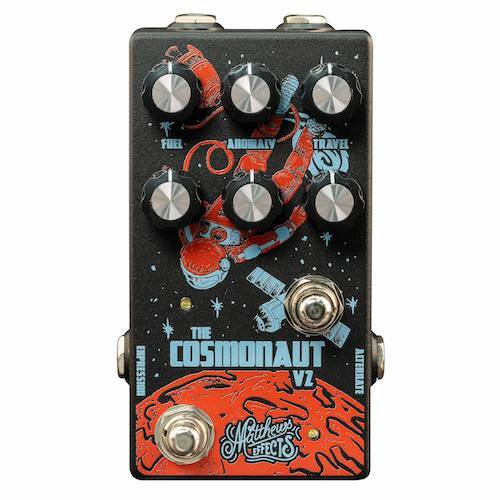 The Cosmonaut V2 is a reverb and delay pedal which harnesses spacial anomalies that let you travel to new frontiers of time and space. The journey begins with two rows of identical controls, allowing you to switch between the top and bottom row with the push of a button. Always visible and editable on the fly, this works as a preset without any programming or menu diving. You can set each row to be a completely different sound. For example, set a deep modulated reverb on one, a tape delay on the other or create any combination of two distinct sounds and alternate between them instantly. For each set of controls, there is a slide switch on the side of the pedal that lets you select either Luna 2, a modulated reverb, Sputnik, a unique plate reverb or Vostok 1, a tape emulating delay. Get lost in the void exploring the vast array of sounds from The Cosmonaut V2. The Cosmonaut V2 has two sets of slide switches on the left side of the pedal that let you choose one of these three algorithms for each row of controls. Luna 2 - A dark, haunting modulated reverb that pushes you to journey deeper into the void. Use "Anomaly" to add modulation to this effect, taking your guitar tone to new dimensions and the spaces in between. 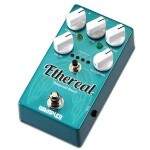 Excels as a dark, warm reverb with long ambient tails or a tight, modulated room verb. Sputnik - The Sputnik lets you warp through space into a reflective plate reverb. Use "Anomaly" to add modulation to this effect. Great for everything from ambient, deep sounds; to short, reflective, light verbs. Vostok 1 - A warm tape emulating delay that excels at a variety of vintage, analog-emulating sounds. Dial in a short slap back with "Travel" control set low, for an ambient other-worldly feel, or choose a high "Anomaly" knob setting for a journey into space madness. Alt Switch (secondary foot switch) - What sets the Cosmonaut V2 apart from other pedals is the Alt controls. The three knobs on the "Top" row of the pedal are duplicated on the "Bottom" row giving you two different settings/sounds which you can jump between. You can independently select the algorithms for each row using the slide switches on the side of the pedal. This creates a simple and straightforward way to get two dynamic sounds on the fly. Analog Dry Path Signal - Your instrument's dry signal path is kept completely analog while mixing in the digital wet signal creating a unique and unparalleled sound. Tails or Bypass Mode - The Cosmonaut V2 allows the beautiful haunting layers to continue as you switch the pedal Off, preventing an abrupt cut to your sound. If you desire that hard-cut when bypassing the pedal, simply hold both foot switches for 10 seconds until the bypass led flashes. Do the same to switch it back. Rick Matthews obsesses over every last detail to make the highest quality and intuitive pedals available. This commitment to detail is on full display with The Cosmonaut V2. From its rugged build, wide range of available sounds, bypass options and alternate settings The Cosmonaut V2 lets you boldly go where no tone has gone before. 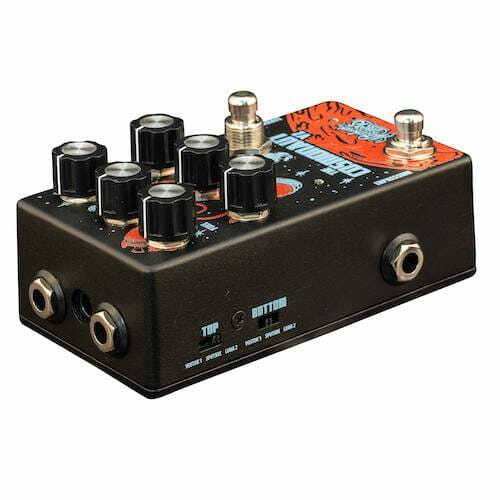 The Caverns Delay Reverb V2 dual-effect pedal combines delay and reverb for the perfect end to any pedal board. Get those perfectly Ethereal tones instantly. 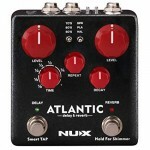 NUX Atlantic will take you to the coasts of Atlantic Ocean, with its deep, smooth and fresh ocean breeze sound. Hear all the whispering echoes and watch the northern lights dancing in cold air… millions of tiny ice crystals moving with the cold wind, shimmering all around the sky.